Apparently, January is the choice time to launch education-focused Chromebooks in 2018. Granted, between CES and the BETT (British Educational Training and Technology show), the time is pretty ripe for announcements. Additionally, these new Chromebook offerings are now all in line for upcoming budget decisions for school systems that don’t routinely stick to to a calendar year budget cycle. Either way, it is very clear that everyone wants in on the Chromebook education market this year. Of the major manufacturers, only Samsung is left without a recent update to its student-focused Chromebook lineup. ASUS didn’t start shipping the Flip C213 until later in 2017, so I don’t expect to see anything from them. HP, Lenovo, and Acer have already announced their upcoming lineups before Dell. So far, Dell isn’t being very forthright with specs and details, but we can tell you what we know. We’re looking at a range of devices from convertibles to clamshells with extreme durability and battery life. Dell is claiming rigorous testing on these models and they should be able to survive just about any classroom. With scratch-resistant displays, reinforced hinges, spill-resistant keyboards and high levels of drop resistance, it seems Dell has done the work to make these Chromebooks last. The Dell Chromebook 5000 series is built to withstand common accidents that may happen in the classroom or on the go with a new robust chassis design that survives 48-inch drop tests and 30-inch drop tests onto steel (the approximate height of a classroom desk on the harshest possible surface). Plus, Dell is the first Chromebook manufacturer with the ability to claim its devices can withstand 10,000 micro-drops. 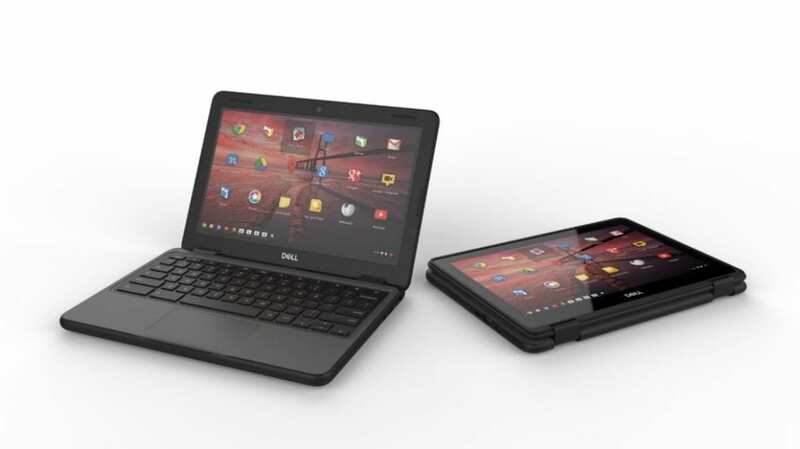 With 4-inch drops performed in multiple angles, Dell could replicate student device damage seen at two to four-year usage. Dell is also adding world-facing camera and EMR pen support to get it on par with what ASUS already has in the market and HP, Acer, and Lenovo have announced. The only other spec details given are Intel Celeron processors (Apollo Lake) and USB-C. It is tough to tell from the image, but my bet would be 2 USB-A and 2 USB-C ports as we’ve seen on many other devices. No word currently on storage space, RAM, or screen type (TN, IPS, etc. ), so we’ll keep our eyes peeled for more details as this develops. Starting at $289, Dell does look to have a contender on its hands for a prime spot in many classrooms.